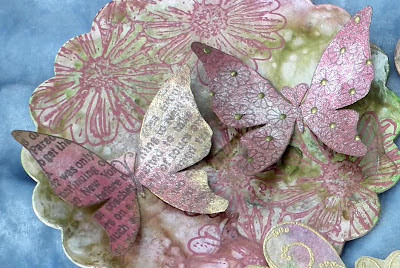 Spraying the Luminarte Radiant Rain and Perfect Pearl Mists on to the Decor Plates or the Mountboard Cut-Outs is very different to spraying on to blotting paper. The surface is not absorbent at all, so the sprays pool and create more of a marbled effect. Below are some Mountboard Cut-Outs sprayed with some of the above ink sprays. The Cut-Outs were dried using a heat gun to speed the process. They were then stamped with some of my new Floral Duet stamp designs. The butterflies and dragonflies were stamped on to inked blotting paper and cut out. This tag has been inked in the same way, stamped and a flower torn from stamped blotting paper. The fern is from Prima, sprayed with the Luminarte Radiant Rains. Liquid Pearls for the cosmos centre. These are so pretty Caroline, a lovely technique. Thank you for describing it. Having bought some of the cut outs I shall definitely be trying this! Just need the butterfly stamps now!! These are beautiful Caroline, I love how the colours have merged with each other. Must check your butterfly stamps now.